Pagham hit United for Six! The Lions unbeaten run continued as they thrashed their visitors 6-1. Six games without defeat and fittingly on Remembrance Day, this was a match which will linger long in the memory. An impeccably observed minute's silence was followed by a Lions display that could have seen them double their final tally. Dan Simmonds' hat-trick & a double from Callum Overton did the damage, but this was very much a team performance. Had it not been for Eastbourne 'Keeper Phil Hawkins, this could have been Pagham's biggest win in many a year. Goal number one came on 12 minutes. Andy Chick sent the ball toward Dan Simmonds, and the Lions' striker made no mistake with a sublime chip over Hawkins. The visitors were denied a few minutes later, an offside flag robbing Joel Kalambayi a shooting chance. Frantic defending by the away side saw Simmonds unable to make the most of a great through ball from Joe Booker. The next goal arrived on 22 minutes, Callum Hart taking advantage of a Lions defensive lash-up to equalise. Pagham kept pressing forward, with Hawkins by far the busier of the two keepers. United's Sam Davison was counting himself lucky on the half-hour, as a cynical foul on Callum Overton was punished just by a yellow card. The resulting free-kick saw Pagham lose the ball in midfield, only to recover & Hawkins save a shot from Overton. United were still in the game with Jaydon Thorbourne striking across James Binfield's goal area. Another from Callum Hart looped toward goal then away from harm. With only a few minutes left of the half, the Lions took the lead. Andy Chick, magnificent in midfield all game, crossed for Callum Overton to hoof the ball beyond Hawkins. No changes at the break, and again Andy Chick was in the thick of it. He and Dan Simmonds combined before Chick was hacked down. Simmonds took the free-kick, which went close before Hawkins parried the ball away for one of Pagham's many corners of the game. Dan Simmonds forced a superb save from Hawkins, heading toward goal from close range. Hawkins wasn't having it all his own way though. A dreadful error on 53 minutes saw him stranded well outside his area, with Dan Simmonds having an open net to aim for. Score he did, and the Lions went 3-1 up with over half an hour to go. Hawkins did better shortly after, with Simmonds shot being well saved. Some excellent approach work from Shay Wiggans opened up United's defence, only for no-one to be there for the cross. Max Howell tried his luck for United, a long low shot being well held by Binfield. A Pagham defensive error, names hidden to protect the innocent, saw the visitors with clear sight of goal. Unfortunately it wasn't quite as clear as they thought, the shot hitting the side netting. 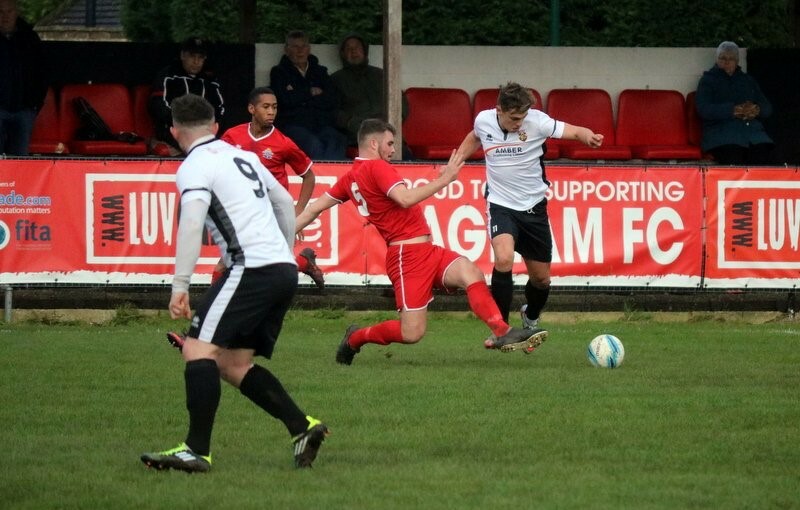 Lloyd Rowlatt was instrumental in goal number four for Pagham, feeding the ball to Simmonds, who went on an unchallenged solo run before striking the ball beyond a less than happy Hawkins. Callum Overton hit the post as Pagham went looking for yet more goals. The next one came Overton's way on 72 minutes, a rocket from the right giving Hawkins no chance. 5-1 up and cruising, Pagham's bench decided to make changes. Rewarding George Bingham & Dan Simmonds well earned rests, Scott Murfin & Joe Ashmore came on for the Lions. Scott marked his return from injury almost immediately with a cross that forced Hawkins into a last gasp block. United were still trying to get something from the game, and only the alertness of Ryan Cox on 85 stopped them getting a second goal. With a job very well done behind him, Andy Chick left the pitch to warm applause on 86 minutes, George Cody making an entrance. A searing run from United's Max Howell came to nothing, as James Binfield easily dealt with the shot. With some United fans starting to leave for the long journey home, Pagham got their sixth. Scott Murfin continued where he'd left off before injury with a superb goal from Lloyd Rowlatt's build up. Just time for Callum Overton to hit the side netting before the whistle blew on a well deserved win for Richie Hellen & Tom Simmonds' side.